High-resolution radar situation displays provide air traffic controllers with aircraft position and flight information. Courtesy: Raytheon. The terminal area surveillance radars that replaced the Ground Control Approach (GCA) rotating-antenna radars. The antenna on top is used for interrogating transponders (secondary surveillance). The one on the bottom is used for primary radar surveillance. In 1943 U.S Air Force air traffic controllers began routinely using Ground Controlled Approach (GCA) equipment to help military pilots land safely in poor visibility. GCA employed a pair of oscillating radar antennas with narrow “pencil beams,” one scanning side to side (azimuth), the other up and down (elevation). A controller observed the precise angle returns from these azimuth and elevation radars and radioed landing guidance to the pilot. GCA also included a 360-degree rotating radar for surveillance of the entire terminal area. This radar used a “fan” beam (narrow in azimuth and tall in elevation) that detected planes out to about 20 miles from the airport and up to altitudes of about 3000 meters (10,000 feet). 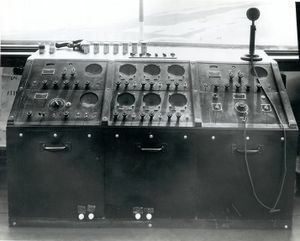 Civil controllers first used military GCA equipment at LaGuardia Airport in 1945, where it helped triple the landing rate to 15 planes per hour. GCA experienced occasional problems, but it worked well enough so that by 1952 it was being used at many airports. By the mid-1950s, however, GCA landing guidance components were being replaced by a new landing aid called the Instrument Landing System (ILS). ILS uses similar course guidance principles, but uses receivers in aircraft that display course deviation directly to the cockpit. While it’s crucial that planes land safely, it is equally important that they be safe during flight. Thus, as ILS replaced the GCA scanning pencil beams, improved rotating radars with faster scan rates and larger coverage areas also replaced the GCA terminal area surveillance radars. As air traffic continued to grow it also became important to track planes in high-altitude airspace. Accordingly, the coverage of air traffic radar surveillance grew throughout the 1960s as long-range radars were deployed along important air routes. Initially, these aircraft surveillance radars had no automatic tracking capability. Controllers pushed plastic markers called “shrimp boats” around the screen to track the movement of an aircraft. By the 1960s radar surveillance of civil aircraft routinely included automatic aircraft tracking. 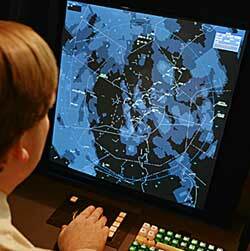 Air traffic control radars now track both aircraft and hazardous weather. Modern air traffic control radars use the Doppler effect to discriminate moving aircraft from stationary targets and to measure storm velocities. Another system developed during World War II, and which had great impact on civil aviation, was the Identification Friend or Foe (IFF) system. IFF depended on special radar receiver/transmitter units located in friendly aircraft. These radar “transponders” responded to coded radar “interrogations” with coded replies to indicate that they were not hostile aircraft. In the late 1950s it was proposed that IFF technology be used for surveillance of civil aircraft. The use of transponders increases the detection range of the radar, eliminates clutter interference from other reflectors, and provides a means of aircraft identification and altitude reporting. In the early 1960s the U.S Federal Aviation Administration (FAA) published a national standard for air traffic control interrogators and transponders. By the end of the decade over 200 ground-based interrogators were in use in the U. S and the FAA made it mandatory to equip aircraft with transponders before they could operate in positive controlled airspace at high altitudes and near major airports. 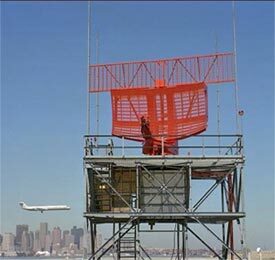 In the 1970s the FAA enlisted the aid of the MIT Lincoln Laboratory to upgrade the original air traffic control radar beacon system to improve its surveillance performance in dense airspace and to expand its coded transmissions to transmit air traffic control data between the ground and individual aircraft. (See Oral History with Lou Meren This “discrete addressed” beacon system uses ground sensors and airborne transponders that are interoperable with the original beacon system, but which achieve surveillance accuracy, capacity, and reliability that is adequate to support automatic safety warning functions for controllers and pilots. In the 1980s the FAA developed an airborne collision avoidance system based on air-to-air surveillance of the same air traffic control transponders used for surveillance from the ground. Today the use of this collision avoidance system is required on all air carrier aircraft operating in the United States and Europe. Radar surveillance to assure safety of aircraft on the airport surface is difficult because of reflections from the ground and from airport structures and service vehicles. Although several generations of airport surface detection radars have been deployed since the 1990s, and surface surveillance performance has improved, reflections continue to cause unreliable tracking. As with other radar environments, surveillance quality on the airport surface can be improved by the use of transponders. Unfortunately, the resolution of the beacon system used for airspace surveillance is inadequate to distinguish between closely spaced aircraft at airports. However, high-resolution surface surveillance can be achieved with multiple receivers on the airport surface that estimate transponder locations by comparing arrival times of replies from conventional transponders. Systems that combine this “multilateration” technique with primary radar surveillance can now achieve surveillance accuracies and reliabilities that are good enough to input to automatic safety warning devices on the airport surface. The development of the Global Positioning System (GPS) has permitted extremely accurate positioning of aircraft. This is especially useful in handling approach (landing) and departure (taking off) control of aircraft at busy airports. It has also in some cases permitted airliners to fly more direct routes between origin airports and destination airports. Free Route Airspace (FRA) are zones where airliners can plan routes that are more efficient than the air traffic services route network. This results in time and fuel savings. Air Traffic Control Radar is generally divided into TRACON (Terminal Radar Approach Control) which directs aircraft during departure, descent, and approach to and from airports, and En Route controllers, which direct the aircraft during the high-altitude main part of their flights. The story of the invention of the Klystron. This page was last edited on 12 September 2018, at 15:39.